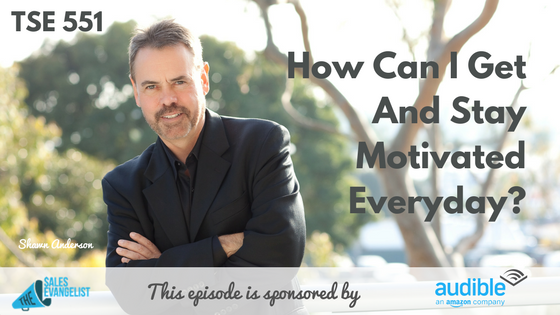 Home » TSE Podcast Post Page » TSE 551: How Can I Get and Stay Motivated Everyday? Motivation is a huge part of every salesperson’s success. But how do you actually stay motivated especially during those tough times? 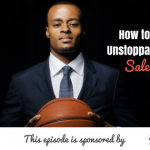 Today’s guest is a motivator and excited Shawn Anderson and he’s going to help you get pumped up to sell and hustle. 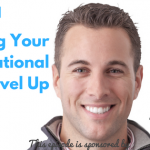 Shawn shares with us how you can get motivated as well as what you can do to make sure you stay on top of your game. Shawn started his path to entrepreneurship at 10 years old, selling worms to fishermen as his very first business. What motivated him to sell those nightcrawlers? Baseball cards. Fast forward to today, Shawn is a motivational speaker, coach, and author. He is also the Founder of Extra Mile America, a nonprofit organization that empowers individuals, organizations, and cities to go the extra mile. When you feel appreciated by someone else, you want to be with that person. If you got that positive energy flowing in you, it’s going to come out of you and people will feel that and they are going to want what you’ve got. If you want something in life, the only thing that truly blocks us from getting that is our own action. Stop giving lip service to your goals. Put legs under it so your goals have the chance to run. The only person you truly lie to is yourself! If you’re not motivated about what you’re selling, you’re selling the wrong thing. If you’ve got to talk yourself out to getting off the ground, why are you on the ground to begin with? Motivation is something you want to do because you want to become better at what you’re doing. We sabotage ourselves all the time and make excuses. The reason we don’t take risks is we let our minds flow with these excuses that we don’t really want something and we let fear stop it. FEAR is what blocks us from having to step outside of our comfort zone. We’re afraid of failing, of losing, of what someone would think, of having to start over. Then when we start feeling fear, we let it dominate our lives. This is when we begin to sabotage ourselves and settle for mediocrity. Step outside of your comfort zone and your world explodes with awesomeness! Look at fear as a chance to either win something great or to learn something awesome and take the whole “lose” part out of it. The one thing that affects him stronger than the fear of getting on the stage is not getting on the stage and missing the chance to share a powerful message that can help change someone’s life. How would you feel if you don’t do the thing that you wanted to do? You don’t have the power to change people. All you can do is change yourself and you will find that the more that you change yourself, the more people around you start to change. Keep being the best you can be and share the message you passionately believe and hope the others will catch that too. The number one virtue a successful person has is a positive person at their very soul. Negative people are not destined to be salespeople for long. Watering the Seed: Have the daily accountability to stay motivated. Stay on top of yourself every single day. Every day is a new start. Every day is a new beginning. Each failure makes you stronger and each of those failures makes the next failure easier to deal with and less likely to happen. Change your perspective on failure and become grateful for those lessons learned because those are what make us who we are now. Look around you and everything you see, feel, or hear can inspire you if you just open yourself up to be inspired. If you look for inspiration, you will be inspired more and more and more! Go the extra mile. If you really want to change your life and create the most amazing adventures, romances, thrills, moments, and meet the most amazing people, you don’t just keep living the status quo. GO the EXTRA MILE! Do more to be more. Give more to live more. It’s in going the extra mile that you get the chance to change your life. Quit blaming others. It’s time to stand in front of the mirror and that’s how you change your life. And when that person in the mirror does more and goes the extra mile, that’s when you start to live the life that you truly love. In 2009, when America was going through some very tough times, people started to lose faith in themselves and started looking at everybody else to make the changes that would make their life better. Shawn decided to use his small voice and did something that reminded people that if you want to live the life you love, you go the extra mile. Hence, the birth of the Extra Mile America Tour, where he paddled a bicycle from ocean to ocean along a 4,000-mile journey. Along the way, his staff created events in 21 cities where he got to talk to over 200 people who have been pre-identified as going the extra mile either through volunteering or chasing their own dreams. At the end of his ride, he gave away $10,000 to the one that had a story that was most inspiring to him. On November 1, 2016, Shawn created a day in America called the Extra Mile Day where 560 mayors across the country declared it an Extra Mile Day and recognized their local heroes who were going the extra mile to make the world a better place. Sign up for Inspiration Thursdays to help you get motivated and achieve your goals. Go to www.shawnanderson.com. Get connected with Shawn through email at shawn@shawnanderson.com. Join our group The Sales Evangelizers on Facebook and LinkedIn.